Founded in 2005 by Jane Hasell-McCosh, the World’s Original Marmalade Awards aim to preserve, grow and widen the British custom of marmalade production, according to their official website. Awarded each year during the Marmalade Festival at Dalemain Mansion & Historic Gardens, the awards are split into two distinct categories; Homemade and Artisan. The Homemade Awards are open to anyone, and incorporate various categories such as Children’s, Merry (alcoholic), Any Citrus, and countless others, ensuring there is a place at the festival for marmalade-makers of any ilk. The full entry fee from all Homemade categories is put towards supporting hospice care in the UK and abroad. The Artisan Awards are the true prize, recognising and promoting small-scale producers making marmalade via the open-pan method. Judged by a highly-esteemed panel, winners are permitted to adorn their products with their ‘Gold’, ‘Silver’ or ‘Bronze’ Award roundels which “declare their marmalade one of the best quality preserves in the world.” Various valuable marketing opportunities can stem from such an endorsement. This year’s festival took place on the 18thand 19th of March, and saw Norfolk-based Ollands Farm Foods walking away with three gold awards as well as one silver, firmly cementing their position as one of the world’s finest producers of marmalade. The gold awards were presented to the company for their Seville Orange Marmalade, Lemon & Herb Marmalade, and Lime & Chilli Marmalade. The silver was awarded to their Seville & Whisky Marmalade. 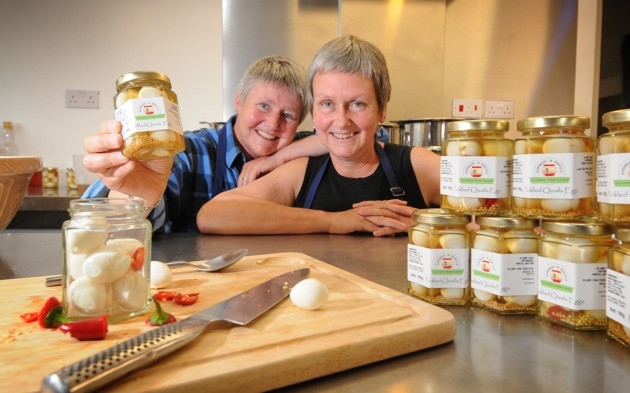 Mary Ann Stuart, who runs Ollands Farm Foods alongside her business partner Kim Holt, said of the awards, “It’s fantastic to be recognised on an international stage – all the hard work has paid off. While 2017 graced the company with its very first gold award before that soon became a triple, this year’s wins also mean that now, each and every one of Ollands Farm Foods’ marmalades have received an award, following the two silver awards and one bronze given to the company during last year’s festival. Ms Stuart and Ms Holt are now preparing for a surge in sales following the awards’ announcement. “I am particularly pleased with the wins for the Lemon & Herb and Lime & Chilli Marmalades. We’ve only introduced these within the last year after months of taste tests. They’re a bit of a departure from traditional breakfast marmalades,” stated Ms Holt.